1. 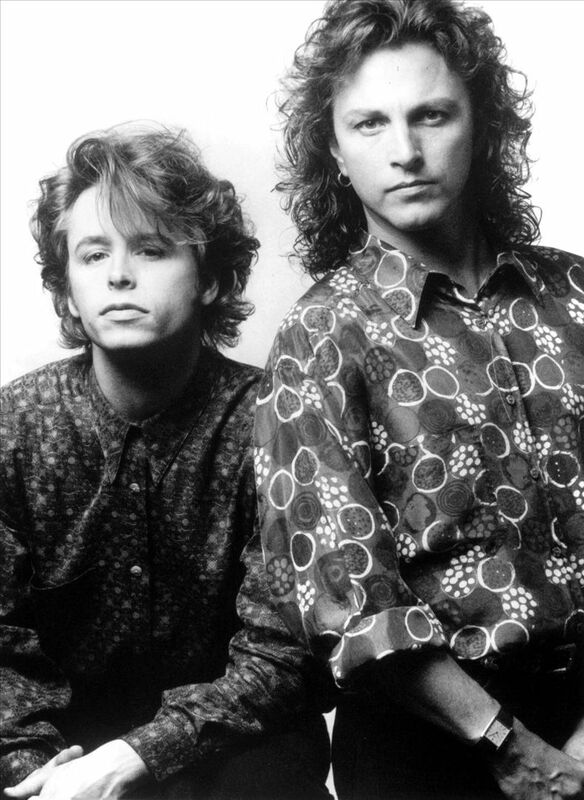 Although The Rembrandts didn’t release their self-titled debut until 1990, Danny Wilde and Phil Solem – the duo who made up the core of the band – first played together as members of the late ‘70s power pop band Great Buildings. 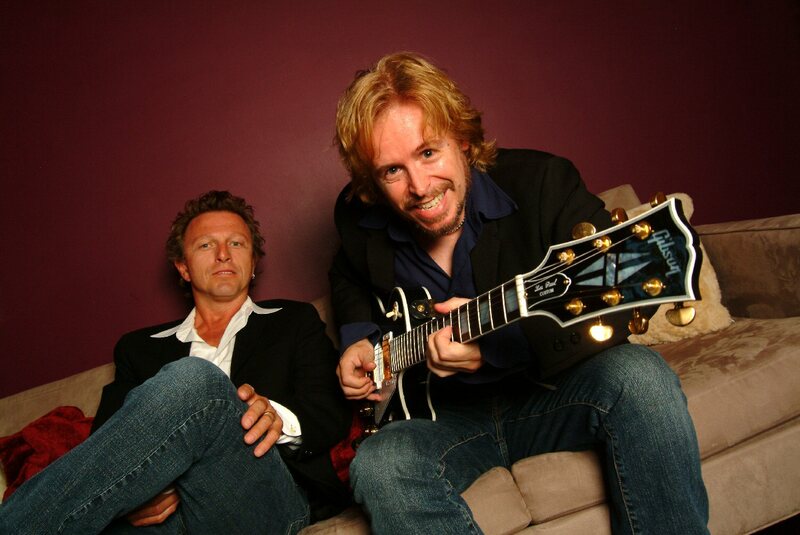 Phil Solem: Danny and I met right after I first saw the band he was in called The Quick. We had a mutual friend that was having a party, and a girl invited me to the party, not knowing that he was going to be at the party. After we had seen his band – among other bands – at this club in L.A., everybody from that club ended up at this party, and Danny and I somehow ended up in the same spot, and we were going through albums and whatnot, looking at the various titles and saying, 'Oh, you dig this? Me, too!' Just kind of comparing notes. Meanwhile, I was very impressed with The Quick. But as it turned out, the girl that I was with turned out to be – unbeknownst to me – one of his girlfriends at the time! So it was kind of a weird introduction for two guys who’d eventually come together musically, but within a couple of years, we ended up in Great Buildings together, once The Quick was kind of fading away slowly. Those guys approached me to play with this new version – or, like, a spin-off – of The Quick. It was Ian (Ainsworth) and Danny from The Quick and a drummer friend of Danny’s, Richard Sanford, and they pursued me to join them for this Great Buildings thing that was just coming together. And I was in another band that played around town, so they’d come to all my shows and try to convince me that I should leave that band and be with them. And really down deep, I thought, “Yeah! Absolutely! They’re my favorite band in L.A.! Why wouldn’t I want to do that?” I was kind of beholden to the gang I was with, and we were just starting to get our feet planted around Hollywood and various things were happening, but musically I felt like those guys were much more kindred spirits. So eventually I joined Great Buildings, and we did a couple of albums together. We got a deal with Columbia, which wasn’t such a bad deal at the time, but then…things just started to change, I guess is basically what was happening. And once that band really started taking off, I had personal stuff going on: I met someone, we had a child on the way, and I ended up moving out of California up to Minnesota, of all places. That was back in 1982, and for the most part I’ve pretty much been here off and on ever since. 2. Through one of his other Great Buildings bandmates, Salem ended up with a rather unexpected credit on his discography: playing on an album by Maria Conchita Alonso. Solem: Our bass player, Ian, was producing Maria Conchita Alonso and writing things for her, and he and I lived in the same apartment building, and at some point he got me involved in some recordings for her. It’s funny, because I hadn’t thought of her in years, but Ian informed us that Maria went on to be this giant star in the Latin world, I guess. I thought of her as an actress, but sure enough, she did all that stuff, and Ian was responsible for making the music come to live for her. I had very little to do with that. I played on a couple of tracks, I think, and that was about it. 3. Between Great Buildings and The Rembrandts, Solem played on Wilde's debut solo album, 1986's The Boyfriend, but the change in dynamic between them made the musical reunion a temporary one. Solem: After I left Great Buildings, Danny just started doing his solo stuff. I think we both kind of wanted to just do solo things anyway, although I didn't anticipate that I'd end up moving to Minneapolis! Nonetheless, he got heavily into that and got hooked up, went forward, and did pretty well during the mid- and late 1980s. Meanwhile, I was just off noodling around and trying to get my music even heard! But I think I played on all of (The Boyfriend) and just contributed wherever I could. We spent a couple of months working on that, and then he wanted me to join him for touring and everything, but I just couldn't see it happening. I mean, we'd been in a band together for quite some time, and I felt like we had this good chemistry, but I was, like, "I'll play on your stuff, but I don't want to be your backup guy." And he knew that, but at the same time, I think he was a bit taken aback that I wouldn't just go for it. So he got someone else to fill that role, and he did a couple of other records with the other guy basically just being his foil, but after a certain period of that, I think he somehow came around and realized that we'd had a chemistry to begin with. So we just started writing again, and it was, like, 'Okay, we're just kind of picking up where we left off." And we came up with the material that became the first Rembrandts album. 4. When they started writing together again, Wilde and Solem weren't thinking in terms of making it big as a band, mostly because they weren't a band. Solem: At first we just thought it was a good idea for us to write some stuff together and thought that maybe we could get a publishing deal and just get our writing skills out there. I don't think either one of us looked at it like, "Okay, now we're gonna start a duo or a band and really go for it!" It was kind of casual: "If we can get a publishing deal, that'd be great. Maybe people will cover our stuff!" So we wrote these songs, and Danny's manager at the time went out and shopped the publishing thing, which happened almost immediately. But then Warner Brothers turned around and said, "Hey, we've got people who are actually interested in signing you to do something!" So we were, like, "Really? Okay, I guess we're us, then. We're the Rembrandts." So then we just hammered the rest of our record together and actually finished what we thought was a demo, and a lot of labels came to us for meetings, and they all had basically the same story, which was, “Okay, we’ll hook you up with a producer, we’ll get some other writers involved, we’ll fix up your image, we’ll give you a big advance,” all that stuff and that sort of thing. But we just kind of waited until Atco Records came along and said, “We think your album’s done. Tweak the mix, let’s master it, and put it out.” And the rest is history after that. 5. Calling themselves "The Rembrandts" was Wilde's idea, but the name itself was one Solem had already been using...for his backing band! Solem: During that time (in Minnesota) in the mid-1980s, I had a band that I called The Rembrandts. So I'd been kicking that name around for awhile. It was called, like, Phil Solem and The Rembrandts. It was basically the name of my backup band. So when Danny and I started working together again in 1989 and we decided, "Geez, I guess we've got kind of a thing going on here, we should call ourselves something," in trying to come up with names that were apropos, I came up with what I thought were many good ones, but he just kept saying, "Why don't we just call ourselves The Rembrandts? Since everybody seems to like that name." And I just thought, "Well, it's not real fair to the guys I've been calling that for the last two years." But somehow we ended up doing it…and, you know, it was pretty catchy! 6. In the credits for The Rembrandts, there's a notation that the album was "recorded & mixed at Dan's Garage." That's not the name of a studio: the whole thing was actually done in Wilde's garage, which also doubled as a guest room for Solem. Solem: I slept on what we ended up calling "the crash baffle," which was a mattress that we put up in front of the drums to separate the sound when we were laying other tracks down. And then at the end of the day, I would just flip that down and sleep on it. Hey, it's a mattress! I just used it for its original purpose! And it wasn't meant to downplay where we recorded it, but, yeah, that is where we recorded it: in Danny's garage. We made records by ourselves in the days when everybody was required to go into a real studio and spend all sorts of money and have all the great gear and everything. Meanwhile, we just had a little 8-track tape deck and a couple of microphones, and we just went for it. I'd say it didn't turn out too bad for what it was. 7. Drummer Pat Mastelotto, who played on all of the Rembrandts’ major-label releases in some capacity (and even co-wrote a couple of tracks here and there), was a founding member of Mr. Mister. Solem: We originally met Pat when Danny and I shared a manager with Mr. Mister, so we'd known him for years before The Rembrandts. He worked on Danny's album The Boyfriend, but I had met him even before then. Prior to that, we'd done some demos of some other material that Danny and I were working on, material which was heading toward what we would eventually do as The Rembrandts, but it just didn't stick. Plus, Danny had also gotten some offers to do some solo thing, so I was, like, "All right, do your thing, I'll be over here." But that's where we met Pat, and he was just the perfect fit for The Rembrandts. In fact, we gave Pat some songwriting credit on some tracks because he was there while we were creating them, because if he weren't there, the vibe wouldn't have been the same. He's sort of been like the third Rembrandt. That guy can play on anyone's record at any given time, and he's going to do exactly what they need him to do. 8. 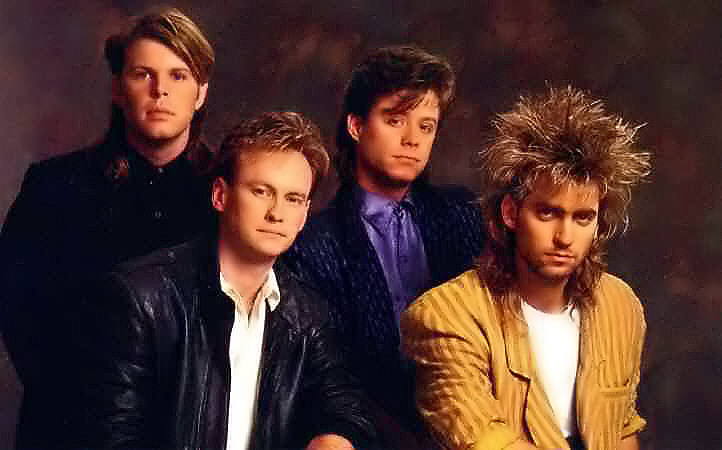 The Rembrandts had a hit with their very first single, "Just the Way It Is, Baby," which made it to #14 on the Billboard Hot 100, but its video was even more popular. Solem: I don’t know if you remember when they used to have a video countdown, but for our first video ever as The Rembrandts – “Just the Way It Is, Baby” was the song – we watched that thing just shooting up the charts, but as far as the video countdown, it made #1. We were out on the road, and was, like, any time we’d get to a hotel bar where they had that playing, we’d just watch, and every week it’d be a new number until it finally hit #1. So that was pretty thrilling. 9. The band’s second single, “Someone,” might’ve been a bigger hit were it not for The Rembrandts having some Extreme competition on the airwaves. Solem: We made a video for “Someone,” and everything was poised for that to really hit hard, and then we discovered that Extreme, who we’d done some shows with and had befriended while traveling, they had a song – one particular song – that was kind of acoustic: “More Than Words,” which was sort of like “Someone.” But in real life, their band just rocked. All of their other songs were hard rock. Meanwhile, pretty much every song we did was like that one song. So they kind of stole our thunder, really. Not that it was a deliberate thing, but “Someone” was our big power-ballad single, and then they came along and tapped into that sound with “More Than Words,” which collided with it, and…well, that’s certainly how it ended up working out. So it was on to the next song for us. We just kept on making more and seeing what would happen. 10. Solem wrote the bulk of “Save Me” and had intended to sing it, but Wilde beat him to the punch. Solem: When I went to do the vocal, I had a cold and I had laryngitis, and I tried to sing it, but it sounded like I was really pushing. So one day I'm off somewhere doing something else, I go back over to Danny's, and I find out that in the meantime he had decided that he would sing it. And he did a great job, but it's, like, "Wait a minute, this is 90% my tune!" But I could hardly talk, we had to get it done, and at the time we thought we were just doing a demo for somebody else anyway. But I always felt strongly about the song, because it came from somewhere inside my past inner workings. I don't know if there's still a demo out there of when I tried to sing it. I don't have copies of anything from back in those days, unless they're in some box in some musty cellar somewhere, and even then, they're probably on a tape that's falling apart at this point. But it's possible. Even so, it's probably an embarrassing recording. I just really wish I could've been able to pull off the vocal at the time. 11. The band filmed the video for "Save Me" under such torrential conditions that they were lucky they didn't need saving themselves. 12. When the band made their debut appearance on Late Night with David Letterman, they shared the bill with George Foreman and shared a couch with a surprise guest. Solem: I was actually just telling someone about this the other day, when I got the latest and greatest George Forman Grill! [Laughs.] We met George, of course, when we got to the studio, and we hung out and everything, and then he went to do his thing, and Danny and I were left sitting in the dressing room, waiting to go on. Everyone at the time was aware of the big fight that was going to taking place between George and Evander Holyfield, because it was this big historic thing. Well, suddenly Evander walks into the room and sits down on the couch between Danny and I. It's just this little couch, one that just barely fits three people, and…he's not a real tall guy, but he's pretty wide! But he sat right down, and the TV was right in front of us with the feed of the show, with George talking to David, and Evander's sitting there chuckling, saying, "I'm gonna go out there and freak those guys out!" Which he did. Because, you know, these guys are supposed to be, like, deadly enemies, but I think they were pals, really. So, anyway, we knew it was going to happen before it happened, which was cool. Unfortunately, by the time we came out, the audience was, like, "Hey, the climax of the show was 10 minutes ago!" So it was a little hard to follow that. 13. "Just the Way It Is, Baby" received the ultimate sign of mainstream success - getting a Muzak version - and if you think it's weird for you to hear one of your favorite songs turned into Muzak, try being one of the guys who originally sang it. Solem: I've had a lot of surreal moments and been in all kinds of places where I've heard "Just the Way It Is, Baby," but when I was a kid and just getting into rock 'n' roll, my perspective at the time was, like, "Well, if you're in a band, you don't want to hear your music in an elevator, because that means you've sold out, basically. You're popular now, and you're not really all that anymore." Because, you know, the stuff they played in elevators when I was a kid was pretty much cheesy stuff. You didn't really hear music that was currently popular. You heard, like, your grandparents' music or something. So to hear "Just the Way It Is, Baby" done by a horn section coming out of an elevator speaker was quite a shock, I can tell you. And I've since heard it in all sorts of permutations in all kinds of different places, so it's just one of those things that happens. But then you realize, "Oh, hey, that means 'ca-ching!' So, yeah, I don't complain about that anymore!